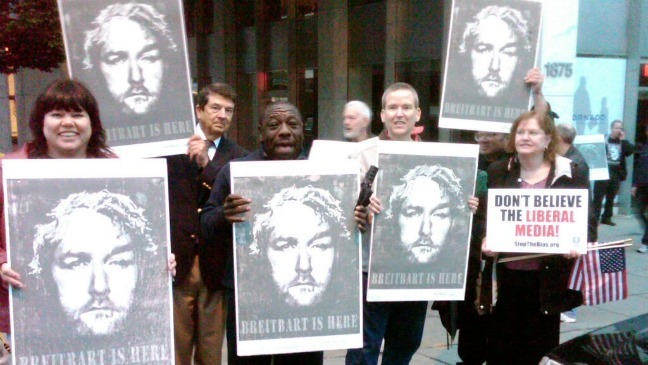 Long before Code Pink came on the scene, the D.C. Chapter of FreeRepublic.com was demonstrating everywhere in D.C.–the White House, the Capitol and Walter Reed Army Medical Center to name just a few locales where you could see the conservative Internet warriors in action. Since 1999, the FReepers, as they are known, have held forth across the street from the Hilton Washington to protest liberal media bias face to face with attendees of the annual White House Correspondents Association Dinner. This Saturday will mark the 15th anniversary of the FReepers’ annual protest. Over the years, the group has debated Al Franken, tangled with Chris Matthews, been filmed by Drew Barrymore, cheered on by Christopher Hitchens and has jeered countless liberal politicians, media personalities and executives. 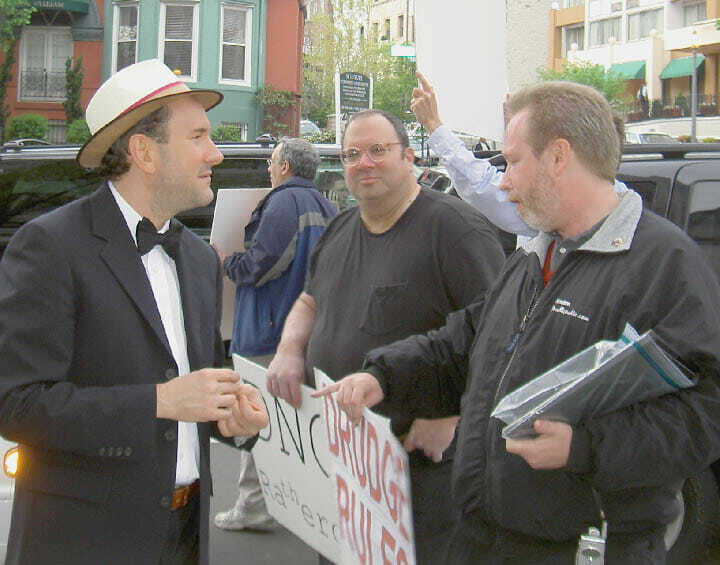 Matt Drudge would stop by and talk with the FReepers in the early years when he attended the dinner. In 2000, he literally took a protest shirt off a FReeper’s back and snuck it into the dinner where he boldly stood in front of then President Bill Clinton while wearing the shirt emblazoned with the famous Alan Diaz photo of Cuban boy Elian Gonzalez being taken at gunpoint in Miami by the Clinton administration. At the 2003 Correspondents Dinner protest, the FReepers presented the Garafalo Awards, named for left wing actress Janeane Garafalo. The prize was a crow mounted on a plate and was awarded to media and public figures who had to eat crow after their shrieks of immediate disaster over the liberation of Iraq failed to come true. The awarding of the Garafalos was featured on Fox & Friends. Costumes and props have played a prominent role in the protests of the dinner. Minnie Mouse, Boris Badanov, Russert the Rat and Crybaby Gregory among others have been seen mocking the self-congratulatory media elite. Signs featured at the protest have included, “Losing share? Try the truth”; “Former Washington Post reporter, will lie for food”; “Raouls’ first law of journalism: Bias equals layoffs” and “Breitbart is here,” a tribute to the late conservative bête noir of the media. To demonstrate media bias, the 2006 dinner protest featured a pop quiz for the media. A sign with the names and photos of Cindy Sheehan and Sergeant First Class Paul Smith was displayed while the question was asked of reporters entering the dinner, “Why are these two people notable.” Anyone who answered correctly for both names won a Starbucks gift card. As it turned out, everyone knew who the President George W. Bush-hating, Gold Star mother Cindy Sheehan was. Only one reporter, Fox’s Bret Baier, knew that SFC Paul Smith was the first service member awarded the Medal of Honor in the war on terror. Only one. The media landscape has changed dramatically since 1999. Conservatives have fought valiantly to hold the liberal media accountable and counter their power of narrative-setting. Next Saturday will mark one more battle in the drawn-out war for the soul of America.